Green garlic and garlic scapes add delicate garlicky flavor to spring and early summer dishes. Green garlic is a hallmark of spring and is available starting in March in warmer climates and into July in cooler ones, while garlic scapes are available from late spring through the summer in cooler areas. Green garlic is young versions of the plants that will eventually produce the heads of garlic found at the store, while garlic scapes are the flower stalks from garlic plants later in the season. Green garlic is usually from soft-necked varieties grown in temperate or warmer climates, while scapes come from hard-necked varieties grown in cooler areas. Green garlic is simply immature garlic and looks like a slightly overgrown scallion or green onion. It is pulled by growers when thinning crops and, increasingly, grown as a crop in its own right. Look for green garlic with fresh green tops. Avoid dried ends or soggy leaves. Browning or dirty outer leaves can be stripped off, just like green onions. To use green garlic: trim off the root ends and any tough part of the green leaves. Chop or slice the white, light green, and the first few inches of the dark green leaves (as long as they are tender). Use green garlic you would green onions or garlic, noting that it is stronger than the former but milder than the latter. It's quite sharp raw and mellows tremendously when cooked. Garlic scapes are the curled flower stalks of hard-necked garlic varieties grown in colder climates. They are cut off by growers to encourage better bulb growth and available through early summer in colder growing regions. To use garlic scapes: simply chop or mince. Add it raw to salads (it has a great crunch), or toss by the handful into stir-frys. If you have a lot of scapes around, make delicious Garlic Scape Pickles. 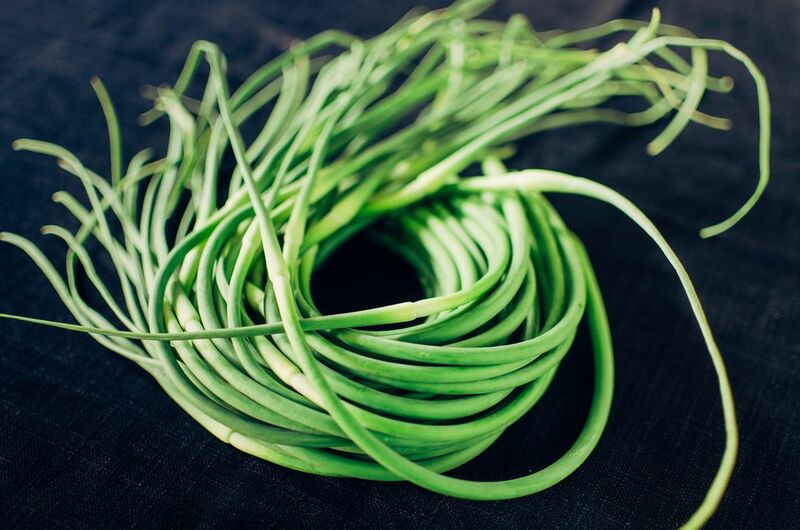 Demand for both green garlic and garlic scapes is growing as more restaurants put them on their menus and people discover their mild but distinctly garlic flavor. They are still mainly only available at farmers markets and farm stands, but you might see them at gourmet markets and even large supermarket produce sections in some cites.